Liam Payne has revealed he celebrated his son Bear's second birthday before jetting to Dubai for work this week. The One Direction star, 25, had received criticism after flying to Dubai on Friday as his hectic schedule once again caused him to work on his son Bear's birthday. But speaking to The Kris Fade Show on Virgin Radio Dubai after his performance at The Global Teacher Prize Assembly concert on Saturday, Liam said he spent quality time with his son before his flight while he and ex Cheryl, 35, are planning a big party for the tot when he returns home. Liam revealed that while he did jet out on Bear's birthday, he spent the day with his son before catching an evening flight. While Liam was busy performing in Dubai the day after Bear's big day, Cheryl was celebrating another birthday - hitting pal Rochelle Humes' 30th celebrations at Soho Farmhouse on Saturday night. In the interview with Kris Fade, the singer also joked that he's had to reign in his love of high adrenaline activities since becoming a father. When he revealed he was keen to try fishing during his day off in Dubai on Sunday, the radio presenters suggested he try his hand at something more dangerous like sky diving. I once jumped off a building, weird way to start a sentence, in New Zealand and by the time we hit the ground we just about got the insurance,' he admitted. Last year, Liam suffered a similar diary clash on his son's first birthday after he was booked to perform in Japan on March 24. Although he was forced to cut the celebrations short, he managed to enjoy time with his son before jetting out of London that night. Just hours before his trip, he marked the big day with a sweet Instagram tribute, where he called the baby his whole 'world,' while posting a very rare glimpse of the tot as a pictured captured them holding hands. 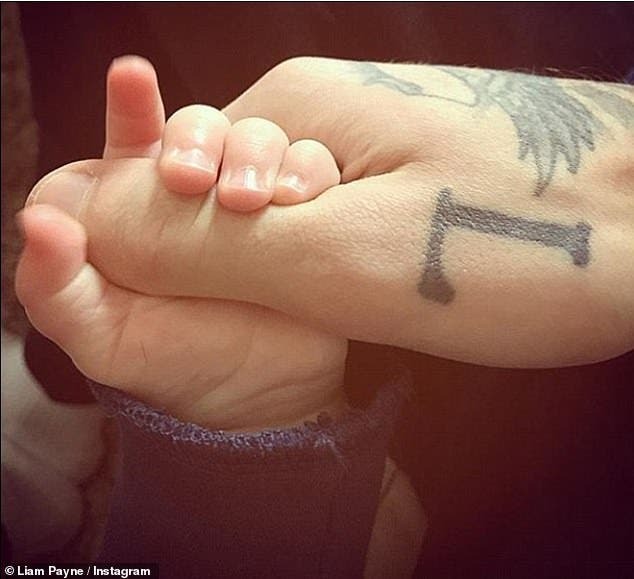 In the sweet photo, Liam's right thumb - inked with an 'L' and wings tattoo - is gripped inside tiny Bear's whole hand. Although Liam and Cheryl called their romance quits nine months ago, they have been successfully co-parenting Bear and even spent Christmas Day together.